NOTE: You are attempting to order an e-book. Please see will it work on my eReader? for directions on how to enjoy this book on your eReader device. 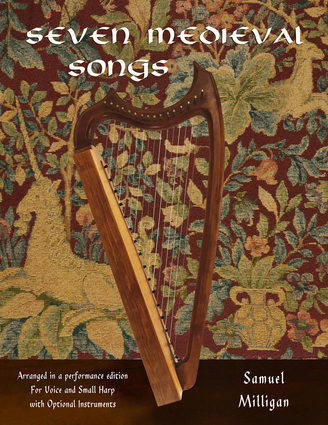 This is a collection of seven uncommon medieval songs from the 12th to the 14th centuries. Milligan's attractive arrangements of these evocative songs include suggestions for the addition of viola and hurdy-gurdy. Perfect for those preparing voice and harp programs or for just noodling around at home. Milligan is one of the most widely recognized arrangers of harp music alive today. Born in 1932 near Joplin, Missouri, Samuel Milligan grew up in the Texas Panhandle. He received a Bachelor of Music degree from University of North Texas, with a major in harp performance. He began a master's degree in musicology, working with Dr. Helen Hewitt, who further fueled his fascination with early music. For many years he organized various conjuntos for the performance of this music, the repertory covering the Medieval, Renaissance and Baroque periods, with emphasis on the music of the Spanish colonial New World. Milligan has been the recipient of two recent awards. One, in 2008, from the American Harp Society, honors his outstanding service to the AHS and to the harp. Another, presented by the Somerset Harp Festival in 2014, is in honor of his lifetime achievement. He currently lives in Brooklyn, New York, surrounded by harps of all sizes and descriptions.